Remember last year when I grew so many rampicante squash in my garden? 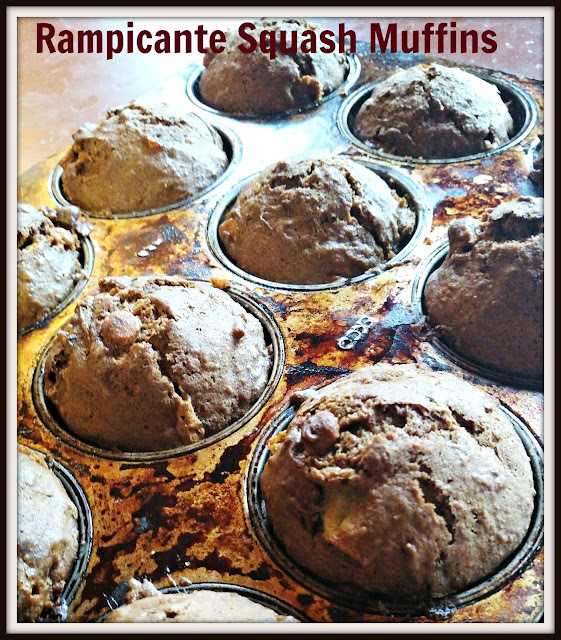 I froze some of it (it's quite similar to zucchini, and you could use zucchini in this recipe if you didn't have rampicante) and decided to make some muffins recently. I'm happy to say that these are kid approved! Preheat oven to 350*. Spray muffin tin with cooking spray (or lightly grease). Mix eggs, oil, and sugars. Stir in squash. Stir in dry ingredients until just mixed. Fold in your extra ingredient (I used butterscotch chips). Bake for 30 minutes or until knife inserted in center comes out clean. These are fairly healthy, and make a great breakfast-on-the-go muffin (they aren't as crumbly as some muffins). My boys love when I send them as a school snack. I envy your garden preserving skills - you are far better at it than I! You've got me inspired to do some canning/preserving again this year. What a cool presentation! Yummy too. YUM.... I looked at your picture and my mouth watered... Looks delicious... Thanks for the recipe. Lisa, I think you could turn rocks into something lovely to eat. You're amazing in all areas. So why Canola oil vs, say, Olive oil? Olá Lis, bela receita...Espectacular ! They look really yummy! It's also a great way to use up all that zucchini that the neighbors keep getting. This would be great to try! I have some zucchini in my deep freezer downstairs. Nom Nom! yummy! hope you enjoyed your Easter! I have to say, this is the first time I've heard of rampicante squash. Those muffins look delicious. My mom used to make pumpkin muffins. I haven't had muffins in probably 20 years. Those look scrumptious. I clipped the recipe and printed it, and I'll ask M to make some. We have one of those pans we got from my mom. today i stop by and learn the word "rampicante." Golly, you are a treasure.